The inaugural music event at Franklin’s Harlinsdale Farm was a success on every level. 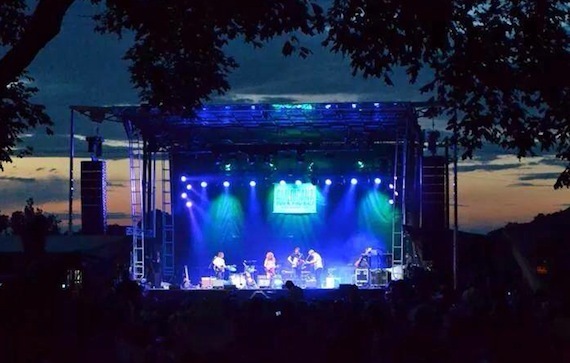 The gig, Saturday’s “Cross County Lines Festival,” was staged by the Americana Music Association with Nissan as the presenting sponsor. Parking, security, ticketing and all the other logistics were flawlessly executed. Sound and lights were top notch. The grassy lawn was comfy, and the balmy weather couldn’t have been better. The concessions featured an array of food trucks (one offering a cheeseburger pie), and the merch tent offered vinyl LPs of several of the headliners. Ah, yes, the headliners. Musically, the fest was a triumph. North Mississippi Allstars leader (and former Black Crowes guitarist) Luther Dickinson opened and earned himself some new fans. So did Joe Pug. The best of the openers was Nashvillian Parker Millsap, for whom I predict Americana stardom. Winsome Ashley Monroe trilled delightfully. Show-stealing Brandy Clark was a revelation. She was practically a living tutorial on songwriting and backed up her troubadour talent with lively stage patter. Clark pointed out with some surprise how attentive and un-rowdy the crowd was. It’s true. The audience was as mellow and appreciative as could be. Patty Griffin was super soulful, dipping frequently into gospel-tinged melodies and grooving steadily with her band. Rocking John Hiatt closed the show and matched Patty for soul-drenched delivery. During the daylight hours, there was a small, acoustic, secondary stage featuring assorted singer-songwriters. I estimate that the six-hour fest drew about 2,000 folks. But take that with a grain of salt, since I have never been known as an expert crowd counter. Kids were admitted free, so the fest had a family-friendly vibe. Several friendly faces dotted the landscape. Working the “room” were Garth Fundis, David Macias, Michael Gray (with his son, who is heading for UT this fall), Jaclyn Carter, Nina Miller, Pete Loesch, Jason Moon Wilkins (who is now with Thirty Tigers), Tracy Gershon, Jed Hilly, Shelley Mays and Jacqueline Marushka. It is my understanding that Harlinsdale Farm is to become a city park. Which is excellent news. It’s across the street from The Factory, where we dined at Saffire, to the accompaniment of a gypsy-jazz fiddle-guitar-bass trio.